Grease an 8-by-8-inch baking dish with butter or cooking spray. Place bread cubes in the bottom of the dish. Set aside. In a large bowl, whisk together egg yolks, milk, butter, brown sugar, sweet potato, cinnamon, cloves and nutmeg until thoroughly combined. Pour mixture evenly over bread in baking dish. Stir carefully to fully coat the bread. Cover and refrigerate for 8 hours or overnight. Preheat oven to 375°F. Take bread pudding out of fridge, uncover, and bake for about 25 minutes, or until the top starts to brown. Remove from oven and heat broiler. Sprinkle half of toasted pecans on bread pudding. 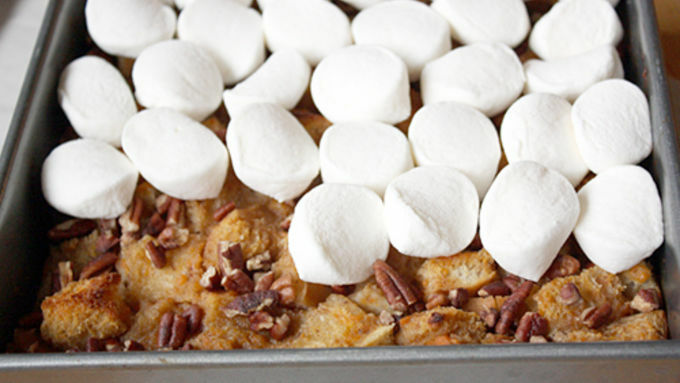 Cut marshmallows in half width-wise and place, cut side down, on top of bread pudding. Sprinkle with remaining toasted pecans. Place bread pudding under broiler for about 1 minute, or until marshmallows are nicely browned on top. Remove from oven; serve warm or at room temperature. I don’t know about you, but the minute temperatures start to dip and the leaves turn color, my mind is on the holidays. Call me a freak, but I like planning out my Thanksgiving menu (we’re hosting again this year) well in advance. Maybe it’s the foodie in me, but I absolutely love holiday food and can hardly wait to make it every year. And sometimes, well, I just can’t wait at all. I have to, er, “test” my recipes before they go on the menu, of course. 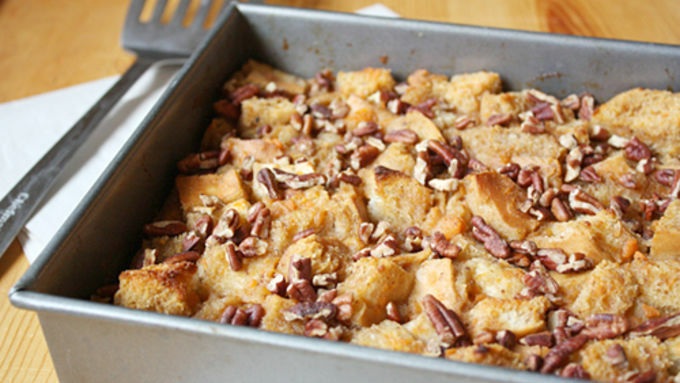 Take this Sweet Potato Bread Pudding, for example. Getting a bit bored with the standard sweet potato pie or casserole on the holiday table, I decided to take dessert up a notch this year and bake this delicious bread pudding. Sure, it’s not even Halloween, but I need to make sure this recipe will knock the socks off my guests! 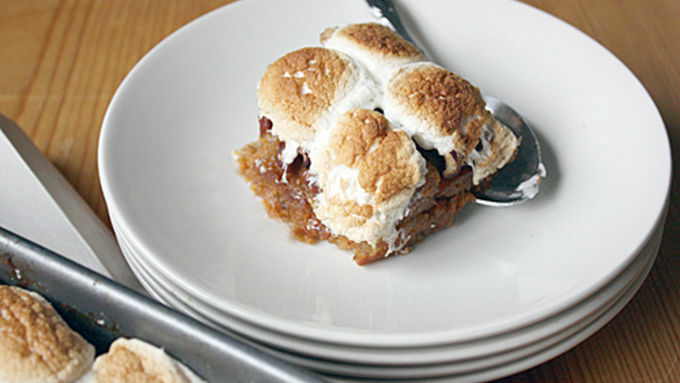 Plus, a girl’s got to be able to have her sweet potato-marshmallow fix any time of year. It’s also a fun twist on Betty Crocker’s timeless, classic recipe for Bread Pudding with Whiskey Sauce, another way to spice up the holiday dessert table. It would be hard to decide which of the two to make for Thanksgiving (which is why I would test them both, if I were you). Firm breads make the best bread pudding because the cut pieces hold up to all of the liquid ingredients without becoming mushy. Although firm bread is best, avoid artisan or rustic breads with a very crisp or hard crust. 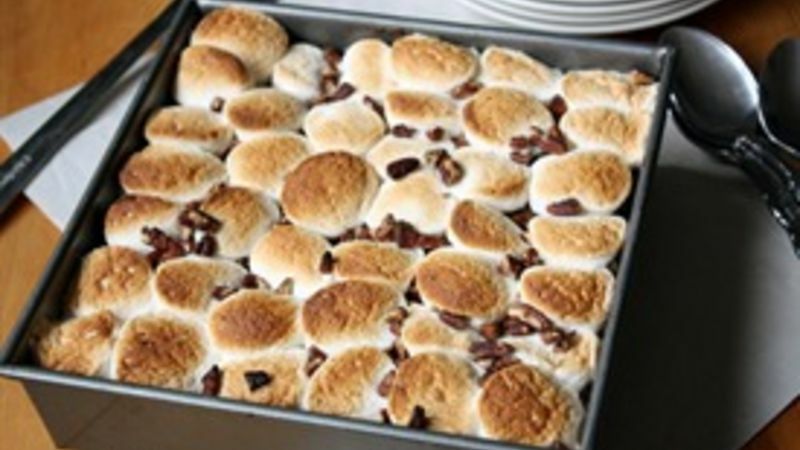 Maybe it’s tacky or old-fashioned, but there is nothing I love more than the combination of melty, gooey, browned marshmallows, toasted pecans and sweet potato. To me, it just screams comfort food. And this bread pudding makes sure to put those flavors front and center with each and every bite. Even coupled with a scoop of vanilla ice cream (my favorite way to enjoy bread pudding), the flavors still shine through. Whether you want to tuck this recipe away for your Thanksgiving menu or, ahem, “test” it out beforehand, it’s an irresistible dessert, and a great new way to make the classic sweet potato-marshmallow dish for the holiday – or everyday dinner – table.